Yesterday was my travel day from hell. I arrived at National Airport around 11 to catch a noon flight to Philadelphia. 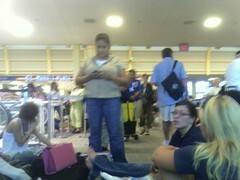 Because of a ground stop at Philadelphia they pushed back the flight to 12:45. We boarded the bus toward the commuter plane. When we arrived at the plane, I noticed that the door was still closed. Due to lightning around National, the ramp was closed and the bus headed back to the terminal. In the terminal it was an endless string of “another 45 minutes” or no communication at all. Flights to and from cities up and down the East Coast were canceled or delayed. While I can’t blame U.S. Airways for the weather, I can blame them for ill-considered policies that exacerbate the delays and make their ground staff work a lot harder than they need to. Unlike some other airlines, U.S. Airways phone agents can’t make changes for customers unless their flights have actually been canceled. As a result, you have 3 or 4 agents at the airport dealing with a line of 50-60 people who need to make new plans. This is never an easy process on bad weather days because it can take 5 minutes or more per passenger to review later flights, alternate airports and rebook. This is in addition to dealing with the few airplanes that are coming and going. Under all this pressure, the agents aren’t able to look at all the options. I called my brother and was able to find other flights, but I couldn’t get anyone to book them for me. By the time I got to the front of the line, those flights had left. On United, I’ve been able to call reservations while standing in line and get rebooked on alternate flights when it looked likely that I was going to miss my connection. Instead of concentrating all the work at one gate at the airport, United smartly distributes that work. United is now adding kiosks on their concourses that allow customers to rebook themselves. It saves United money and customers can see their options. Around 5 p.m., we got the go ahead to re-board the Philadelphia flight. This time, we got off the bus and on the plane. A few minutes after boarding, I see the bus return and open its doors. About the same time the pilot comes out of the cockpit and says dispatch is canceling the flight, but he’s trying to talk them out of it before the bus comes back. Too late. The one good thing about my seven hours at National was that I got to spend quality time with Facebook Mobile, updating my status, checking up on what friends were up to, and uploading pictures and my first mobile videos. It’s among the best mobile-Web integrations I’ve seen yet. More on that later. This entry was posted in airlines, customer service, facebook, travel. Bookmark the permalink. At least you got to see Steve McQueen, eh?